First-person puzzling meets moral quandary. From the makers of Pneuma: Breath of Life, The Turing Test is a first-person sci-fi-inspired puzzle game that echoes the likes of Portal and The Talos Principle—at least in theme, style and concept. 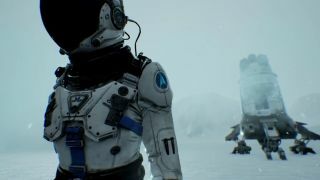 During a brief viewing at the PC Gaming Show last month, we learned that it’s set on Jupiter’s moon Europa and that “it's based in an underlying reality, of wanting to tell a story that could actually be true,” according to the game’s writer and designer David Jones. Filling the shoes of Ava Turing, The Turing Test tasks players with uncovering the seemingly shady dealings of the International Space Agency—Ava’s employer. And what’s the best way to do that? By overcoming a series of logic puzzles with the help of a disembodied robot narrator, obviously. Questionable premise aside, I really enjoyed my time with an early build of The Turing Test earlier this year, and the puzzles shown above look distinctly more sophisticated than the ones I sampled before. I'm now looking forward to seeing how all of that ties into the narrative come August 30.